Magento made its foray into the world of website development and design in the first quarter of the year 2008. Magento is a robust, user-friendly and flexible open source web application. Acquired by eBay in 2011, it has brought a sea of change in the field of website development and design. It is the most trusted content management system present today. The dynamic design is good for both web and mobile platform and the design makes it adaptable, scalable and flexible too. Customization is a great feature of Magento. It can be customized as per the needs of the customer. The template system allows creating new and amazing layouts and designs for desktop and other devices with varying screen sizes. Capable of supporting multiple languages and currencies. In this article, we will study the various options of Magento that make it such a popular platform for website development. Magento Go is the ideal ecommerce solution for small businesses who want to make it big in the business world. It helps in creating an online shop that can sell quickly and easily. It is highly flexible. The owner can customize the feel and the final appearance of the site and this does not require any prior knowledge of designing. For instance, products can be realigned by just dragging and dropping. Also the text of menus and buttons can be altered without the help of HTML code. It supports all types of products and provides unlimited product options. With Magento Go, a lot of options can be exercised such as linking multiple products to create bundles and groups. Layered browsing empowers the customer to search their choice of product easily and quickly. Customer engagement can be enhanced by customer assisted shopping, product comparisons and wish list. It enables access to Magento Connect app store in addition to around-the-clock assistance from Magento team. It is search engine friendly as well. The best part is that the developer’s can have a peace of mind as regards the set up of the software and administration of the server. 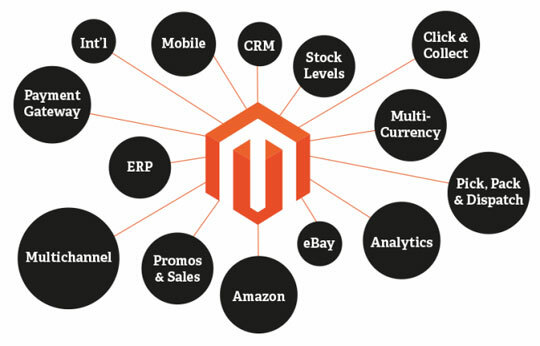 Magento enterprise is specifically designed for big businesses. The outstanding features of enterprise edition that one witness are reward points, gift registry, invitations, events, content roll back, enhanced customer categorization and targeting and many more. The store is optimized to highest development standards. The customers can segregate products on the basis of their habits and inclination. The Magento Enterprise is loaded with a lot of payment options. This includes pay by check, purchase orders, money orders and gift cards. Single page checkout ensures trouble-free payment. Advanced security system is also in place for Magento Enterprise. Shipping services are better. It gives the freedom to display special content, special promotions to attract customers and have email marketing campaigns depending on the customer’s product browsing habits. It provides uninterrupted services and one-on-one support from the Magento team. All this makes it such a valuable tool for unleashing an unmatched user experience. Magento Community is for the innovative class of people. They can add their attributes to the existing CMS by downloading and installing extensions from Magento Connect. This is beneficial for people who have in-house development team who are well trained in handling Magento and can make the desired changes as per the requirements of the business. The user has full access to the Magento extensions, Magento themes, MCommerce, SEO friendly urls, multiple-language support and much more. The latest edition perks up product quality and stability, tax calculations, improves performance and security. The draw back with Magento Community is that there is no Magento team for help as in the case of the other two Magento options. A multitude of Magento themes make it huge fun to work with. I think I have listed ample reasons for you to use Magento and grow your business. It is undoubtedly a great tool with great flexibility. This article is written by Kally. She is a regular writer for ThemeHeros. She is passionate about writing technical stuff to solve various issues related to Magento themes and other open cart themes and templates. She focuses on the latest concepts that have been introduced in the field and their better utilization for businesses. How to Build a Site Using Joomla – The Best Learning Guides – Look for Them Here!